I thought this one warranted a quick post. What better way to celebrate one of the seven natural wonders of Portugal than with a two-day festival, headlined by legendary DJ and Producer David Guetta?! Sete Cidades will play host to the two-day Azores Green Fest. 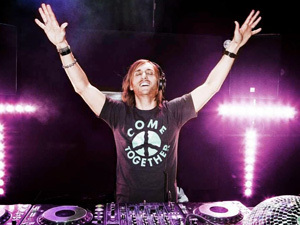 DJ and producer David Guetta will headline the festival’s concert Azores @ Night on July 18th. Local DJs and entertainers will join world famous Guetta for a one night only concert in a volcanic crater surrounded by the stunning green and blue twin lakes. Azores Green Fest will celebrate the conservation of the Azores islands’ lush land, allowing guests to connect with nature and participate in well-being focused activities such as yoga, massage, tai chi and meditation. Other activities during the festival include educational conferences and workshops centered on the importance of maintaining the Azores’ esteemed environment. While in the Azores, only a five-hour flight from Toronto with SATA Airlines, visitors can discover protected wildlife in their natural habitat through whale watching and swimming with dolphins. Adventure travellers can explore the Azores’ volcanic landscape through cycling, hiking, paragliding, kayaking and horseback tours. Brought together in an archipelago and formed by ancient volcanoes, each of the nine islands that make up the Azores has its own unique landscape, culture, cuisine and architecture. Located 1,360 km off the coast of Portugal, the Azores islands are home to an abundance of flora, fauna, ocean wildlife, and natural parks. Because these islands are dedicated to preserving their natural legacy, the Azores is considered to be a sanctuary of biodiversity and geo-diversity and one of the best locations for nature tourism. What: As part of the two-day Azores Green Fest, the Azores @ Night concert will celebrate the conservation of the unspoiled Azores islands. When: July 18th and 19th, 2014. Where: Lagoon of Sete Cidades – the twin fresh-water lakes located in a large volcanic crater on the Azorean island of Sao Miguel.